Yesterday was another "summer-like" day here in the mid-atlantic region, and I was determined to head out and paint en plein air at my favorite place, River Farm, which is along the Potomac River and also happens to be the headquarters of the American Horticultural Society. This site has some of the most beautiful gardens in the area, and it seems like every week something new is in bloom. This painting was completed in a garden of mostly shade loving plants. The large tree that provides most of the shade for this area is an Osage orange, and was my main focus of the painting. This particular tree has been recognized as the largest Osage orange in the United States by the National Register of Big Trees in 2011, and is estimated to be 200 years old. I blocked in the painting with burnt sienna, focusing on the pattern of light and shadow. 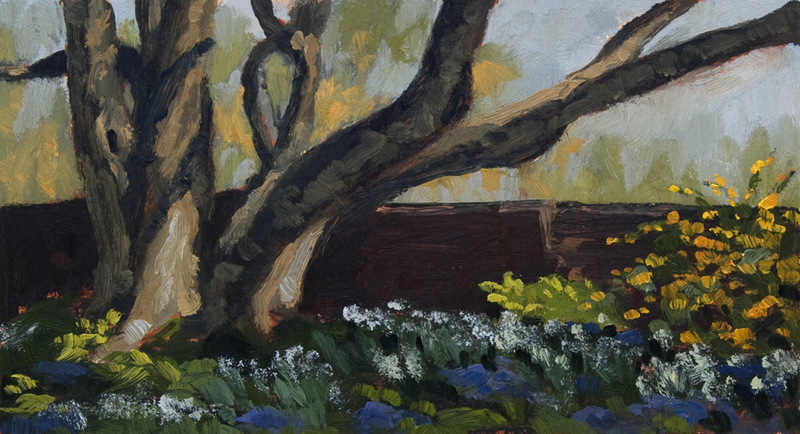 I forgot to bring my umbrella for the easel to keep direct sunlight off of my painting surface, so while painting I really tried to keep the main idea of the play of light and shade on the tree and how the brick wall was a dark shape that framed the garden.